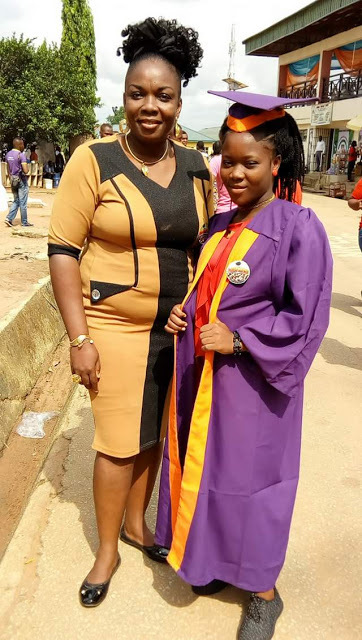 According to a Nigerian facebook user, Gloria Ernest Samuel, on Wednesday celebrates her housemaid of 13 years, who recently gained admission into a higher institution. It wasn't also easy to raise a child with certain orientations.But l tried. When the task became too tedious,I packaged her home, but the father gave us a mind boggling question: if she is your daughter, will you throw her away? Please, train her as yours. I want her different.As stunning as that question sounded, l thank God that l took that challenge seriously and to my heart. I teach, I scream, I plead, l appeal and l advice... To make sure she turns out better than she would. Sometimes, she makes me furious, laugh, cry, and proud, just like now.From Primary 2, she had gone through to secondary, made her papers, have trained on computer literacy before going for skill acquisition. Today, she has moved to a higher level. She is matriculating at Alvan Ikoku Federal College of Education, and l am so happy that our 13years together is not a waste after all.She has long ceased to be a maid in my home.She is now Aunty's Auntie, my little sister, my children's Auntie. And no one knows she is not my sibling. Uchechi, today is the beginning of a new life for you. We are happy for you. Sky is your jumping pad.We pray that you graduate with flying colours. And we continue to pray for financial breakthrough so that you do not suffer any stress concerning your education. Congratulations, dear. We are super proud of you.